In the previous post we have developed the VIC-II core and managed to display some dummy data. In this post we will be integrating this VIC-II core within our C64 core and see if it could render the C64 startup screen. This rendering will be again performed within a simulation. Since more than three weeks went by since my previous post, let me start off by doing a quick refresher on a couple of points. In the previous post I have mentioned that the VIC-II and 6510 can share access to the main memory with 1MHz clock signal where the 6510 access memory on the rising edge of the clock and the VIC-II on the falling edge of the clock. Occasionally the VIC-II would need some extra memory cycles to retrieve the character pointer data from screen memory. The VIC-II get these extra cycles by stealing it from the 6510 processor. Obviously, during this time, the 6510 cannot really do anything. During this "cycle stealing", the VIC-II access the contents of main memory at a speed of 2MHz. This memory model just described will not work for Block RAM on an FPGA. With Block RAM you can either access the RAM on the rising clock edge or the falling clock edge, but not both! Luckily Block do allow simultaneous access via dual port mode. In dual port mode you can connect both the 6502 and VIC-II to separate port of the Block RAM, allowing them to access the Block RAM simultaneously. We will need to clock our Block RAM at a speed of 2Mhz to cater for maximum read speed when the VIC-II steals cycles. The cpu clock is shown at the bottom, with the memory clock is shown for reference at the top. So, in other words, the 1 Mhz signal is achieved by skipping every second pulse. mem_clk is the new 2MHZ clock that will drive our block RAM. c64_clk is the 1Mhz signal generated by the VIC-II. You will notice that a new port is added to the vicii called c64_reset. Why this port? Well, during the reset process our VIC-II core doesn't emit any clock signal on c64_clk. our CPU, however, needs a couple of clock cycles during reset to properly initialise itself. To cater for this reset need of the CPU we have added the c64_reset port. Basically when the VIC-II is up and running, and therefore c64_clk pulsing, we apply a reset signal via c64_reset for a couple of clock pulses. As mentioned earlier, there is a couple of changes we need to do to our existing Block RAM instances: Making them dual port and should be able to clock at 2MHz. Let us first have a look at the 2MHz requirement. With the CPU clocking at 1 MHZ, a 2MHz memory clock basically means that we have an extra memory clock pulse between two CPU cycles. This have the side effect that if the CPU puts an address read request during one CPU clock pulse, the data will already be available for consumption at the next CPU clock pulse. While the above sounds like something good, this behaviour will actually break the assumptions the Arlet Core is build around concerning FPGA block RAM. To solve the issue surrounding block ram timing assumption, we should add some delay elements in front of the inputs of the block RAM so that it behaves like a Block RAM clocking at 1MHz. As you can see, we delay the Write Enable signal, requested address and data tow write by one clock cycle, effectively eliminating the advantage of the 2MHz signal. Next up, we should hookup our VIC-II to our memory. We all know that usually bits 15 and 14 of the VIC-II address is provided by peripheral register $DD00, but for now we are just going to leave them hardcoded to 0. We have added an extra always block also returning content of the ram array. When performing synthesis in Vivado, the synthesis tool will spot the two always blocks utilising the same ram array and synthesise a dual port block ram instance accordingly. I have also added a combination block via the casex statement, for the whole purpose of enabling the right block of memory. For now it looks a bit silly, since it only have a default selector, but we will be adding an extra selector soon. As we did for our cpu interface in a previous post, we also delay our address by one clock cycle. This is again to compensate for the way block rams work. we have added the selector 14'h1xxx because the Character ROM is mapped at addresses $1000-$2000 in VIC-II address space. You will notice that our Character ROM element is only a single port. For now it is only necessary that our VIC-II instance have access to the Character ROM. 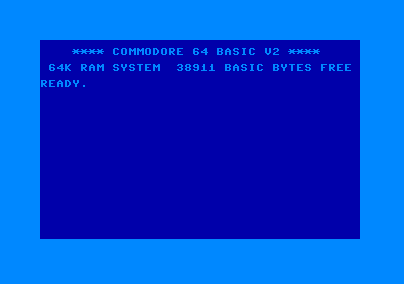 One final block we need to map in the address space of the VIC-II is the Color RAM. Currently we also don't have a block to store the contents of the Character ROM, so we will need to create one. This time around, however, the Color RAM will need to be dual port, as opposed to the Character ROM. We need the CPU to populate the Color RAM with meaningful data so that a meaningful picture can be rendered. We will therefore start off by first implementing the Color RAM with an interface to our CPU. We have defined WE_color_ram so that we only write to color RAM if the address is within the color RAM range. This is all the modications needed to interface with the CPU. The interesting thing is that we don't need an entry in the combinational logic for color RAM. Color RAM has its own dedicated set of wires going to Databus of the VIC-II. So, we basically concatenate the output of our color ram together with the output of the combinational logic for our VIC-II. Time to write some code to test our C64 system with the new addition of the VIC-II. The only difference is that we wait longer, giving the CPU change to initialise the system and writing the welcome message, before we take a snapshot of the VIC-II output. It is so simple thing, but with each flavour of a C64 emulator I have played around with, if get to this screen, it is always an aha moment for me. It just give me the confidence that I am more or less on the right track. In this post we have added the VIC-II core developed in the previous post to our existing c64core design. We also confirmed that running the simulation, our VIC-II did indeed render an image resembling the C64 welcome screen. In the next post we will add our C64core/VIC-II block design to our Vivado block design for running on the ZYBO FPGA. We will also try and see if we could write the output of our VIC-II core to the SDRAM of the ZYBO. Writing the data to SDRAM would enable us to retrieve the image data via the XSCT console, allowing us to verify if our VIC-II core function correctly within FPGA hardware.